Series devoted to saving treasured heirlooms from the scrapheap. The team swings into action once more against the stunning backdrop of Burghley House. Find out how much on Restoration Road Show. Here we are at Burghley House in Lincolnshire. is its team of in-house restorers, who work across a variety of ongoing projects. in the stable courtyard, and can be called upon at any time. 'and maybe bring back some of the sparkle. they're going to charge me probably £600 or £800 for it. 'Should they be cleaned up and restored? 'And will they end up back home, or make some money at auction? I really want to fondle that. I like grandchildren, they bring me lots of work. and this grey beard will get a little bit greyer, I think. The good people of Lincolnshire are arriving today with carloads of treasures. There's a pot with a bit of history to it. but our restorers are always ready to advise. This painting's been rolled up, which is not the best thing to do to canvas paintings at all. 'I've got my hands on a lovely Georgian snuff box. I see a few names on here and a few dates. -And everybody's called Fowler. Family name? My grandfather was the last parish tax collector in Lingfield, in Surrey. His predecessor, I think, the tax collector before him, was a Fowler. And I believe that the last Mr Fowler gave it to my grandfather. Probably around about 1925, 1930. All right. So it's been in the family for quite some time. 1711. That's going back a while, isn't it? -That really is going back a while. My wife and I looked at it some months ago and we thought, what a sad object it is. and we did wonder whether we could find somebody to give it a good home. and it's semi-translucent, and you can see that it's actually tortoiseshell. Since the 1970s, the trade in tortoiseshell has been tightly regulated. But in its day, it was highly prized. I think an auction house would probably quote £200 to £300, in this condition, anyway. And it goes without saying, when you find them in tip-top condition they can fetch an awful lot more. But this one isn't up to snuff. It needs some expert care to get it back to full health and ready for auction. Lucky for us, Rodrigo Titian is on hand. With a lifetime of experience specialising in decorative objects, not much fazes our Rod. But even he was taken aback when he saw the name on the base. It's as if I have John Fowler blood running through my veins, kind of thing. That's how I feel about John Fowler. So seeing this now really excites me. The hinge, or the hinge area, is obviously, as you know, a bit damaged, a little bit loose here. We can tighten the hinge mechanism up a tiny bit just to secure it a bit more. Also, in fact, the finish itself is a bit grubby. -it will actually come up a little bit better. I mean, the first minute they can spit on something, they do. They say, oh, it's the enzymes, Eric, you know. so it doesn't rock like that, you're looking at about £100, to do that. £80, to do that. So you're bringing it up to about £180 now. Once restored, if you do everything, it could be worth up to £400 plus. -to make it as it is, looking better. -Yes, OK. I can see where you're coming from. and just do the rest of the work, it's still acceptable. and that's probably a good route to go. John's decided not to go for the full restoration. He's going to get the clasp tightened and have it cleaned and polished. As Rod says, it's looking a bit grubby, so in its current state it's worth around £200 to £300. something not to be sniffed at. and help it really shine at auction. and ready to deal with anything and everything that's put in front of them. otherwise it doesn't match and it looks silly. Next up, Keith Slater is desperate for a bit of help and advice. for quite a lot of money, but now he's what you might call a bit snookered. and use a Capodimonte name, and some of them do. But this one, I see, has the mark here. It looks like a cast from a chess set. His factory is very highly regarded, so it is a good piece. So tell me, where did you acquire this? I acquired it in 1982 from a Capodimonte sale, which they had in Sutton. Obviously delighted, because it reminded me of when I was younger. -up and down the country, no doubt? we need you to have a shot at getting play started again. a lifetime working with ceramics, he can turn his skill to most things. So come on, Roger, these poor chaps are desperate for a game. I left it at my in-laws' and they let their grandchildren play with it. I like grandchildren, because they bring me lots of work. They're always breaking things, so I have no objection to them at all. So how much did you pay for it? Can I ask? -Did your wife know that? currently only worth about £80 to £120. But on the plus side, I'm sure it can be restored, and that's what you really want. But what's the score when it comes to the question of cost? would probably be around £50 to £60. So what do you think? Do you think it's worth spending the money on it? I think so, yes. It would be like a labour of love, and I want to keep it. could fetch up to £300 at auction. But Keith's not looking to pocket any money. He just wants to get the lads back on the table. So, Roger, it's game on. Mix that glue and match that paint and see if you can chalk up another success. Coming up, two silver candlesticks arrive, but are they a pair? The shop put them up on the shelf, and he just happened to get them mixed up. And, will this 300-year-old snuff box be in with a sniff when it goes to auction? We're privileged to be here in the magnificent grounds of Burghley House. who have done us proud. I'm intrigued to know where you got it? If I wanted to pick that up from a gallery, they're going to charge me £500 for it. and this next treasure is an absolute delight. that's been in her family for a few generations. and she's 21 in the picture. She got married in the November of the same year that the box is dated, 1873. This his her who's probably been inscribed here? I think this is her on the box, yes. -I believe the box was passed down to the eldest daughter of each generation. I received it when my mother died, my mother died very young, at the age of 56. She passed it on in her will to me. That's why I love it, of course. I in fact have a daughter who will eventually inherit it as well. 'But this is one poorly heirloom. 'It will take an expert to help the interior regain its silky luxe. the inside here, that's actually in perfect condition to be honest. -It's a beautiful, vibrant blue. -I'll give you an idea of the restoration aspects, and the costs involved. We've got the frayed silk here, that's missing the cushion sections on all four sides. The one at the front here is really gone, isn't it? -So that definitely needs replacing. we can only match the silk colour to a degree, plus or minus. -So there's going to be a difference, unfortunately, aesthetically. Rod's going to find it hard to match the silk. In its present condition, this sewing box is worth around £120. And, with all that work involved, it's going to cost Liz £300 to have it restored. And then it'll only be worth around £250. But I would really love it to be restored fully. It's a piece that I've always loved. far more to me personally to be able to pass it down to my daughter as it originally was. -And hopefully with the same colour silk. but even more so when it's something that is of deep sentimental value. So, Rod, I've got everything crossed that you can find the colour to match that original blue silk. It needs to be able to survive another few hundred years in Liz's family. Many of you have decided to bring your lovely treasures to our Restoration Roadshow today. 'desks to rebuild, some broken and some just waiting to go to auction. but I think it's not really worth restoring. And our next case is a pair of early 1920s silver candlesticks, brought in by Jean Abbott. So where are we with these? -up on the shelf and he's just happened to get them mixed up. But they would have been made only months apart, so they were sold as a pair. And as there is only a year, it can be accepted as a pair. -They made quite a lot of these, an apprentice might have 30, 40, 50 to do in a week. Yes. This is a very mass-produced pair of sticks, the style that they've always done. who is based here in Burghley, is a specialist gold and silversmith with over 40 years' experience. It's had a good life. the wax that's fallen on there, and that's what worn it away. You can see where it's gone right through the edge. This is very, very, very thin. This piece has lost it totally. If you wanted to sell them at auction, how much do you think an auctioneer would estimate those for? I think you're going to be looking in the region of about £40 to £50 in the state that they are in. I wouldn't recommend restoring these. The cost will certainly outweigh whatever you would get for it. They've had a good life. and as June wants to sell them, she's going to take them straight to auction just as they are. Please, come on. Somebody help me. Our restorers have their hands full today. Loads of items have come their way, but they never give up. Rod started the day on a rather grubby 300-year-old snuff box ingrained with dirt and grime. So far, what I've done is actually just given it a very light clean. I've actually concentrated on the right-hand side of it. As I'm looking at it here, you can actually see a big difference already in the way it's reviving. a bit more abrasive with what I'm actually applying. And as I start to penetrate down, it will actually improve and actually stay that way. in about ten minutes that will come back up again. more like that, because the blooming will get less and less and less. there is the potential I could break it somewhere, so I've got to be very delicate with it as well. So will Rod strike the right balance between elbow grease and lightness of touch? We'll find out later. Remember the jolly Capodimonte ceramic billiard table with the broken cues? ready for painting, but it turns out these cues aren't quite what they seem. The strange thing is that they are metal. painting these metal cues, that shouldn't really make any difference. It's rather ironic that I have lots of porcelain, I've ended up doing the metal. and I have every faith you can turn your hand to a bit of metal work. Those two cues will be ready to glue back onto the billiard table itself. but, hey, remember to make those cues straight! of trying to help this lovely 19th-century sewing box. He's had to pack it up and take it to his workshop. When you are looking at saving things, if you can salvage as much as possible it's always nicer. I think in this instance the silk itself is just too perished, it's so far gone. It's frayed, it's got loose ends everywhere. It really isn't going to be a matter of saving that at all. because there's a chance I might be able to use the backing itself. It's always good to think that way. it's giving me the option to be able to use it. keep as much of the original as possible. which was the only one that I could find which was as close a match as possible, hasn't arrived. this lovely sewing box is going to look distinctly threadbare. 'It's that time again when our restorers have done all they can for your keepsakes and antiques. Keith Slater brought in a 1970s billiard game. as he's had to work with metal rather than his preferred ceramics. Will Keith be happy with the result? -There we are. Back to its former glory. Very good, yes. Did you have any difficulty with it, Roger, or...? it's very, very thin and there's a very small surface area to glue the two pieces together. Before the old boys had lost their cues, but now they're ready to play their shots again. That's fine. That's really nice. 'Well, I'd say that's one satisfied customer. 'Can Rod make it two? Time to find out how he's got on with that dusty old tortoiseshell snuff box. 'with over 300 years of dirt and falling apart at the seams. Come on, Rod. I can't stand the suspense. I want to see the result of your labours today. Reveal all, come on. Let's go for it, then. a lot nicer than I thought. Before, this grimy snuff box wouldn't have graced anyone's pocket. The shell was grey and cloudy, the hinge loose and the detailing covered in dirt. Now it's been given a new lease of life. I have to say, that is remarkable. I didn't realise that this was sort of a type of pique work? -With these little silver studs. That alone, I think, to be honest, has actually made the piece really stand out, much more attractive. Well, you've just spent £100, so the big question is, do you think it's money well spent? Yes, I do. I think it's brought it back to life. I could even use that word "resuscitated" it. Especially that lovely pattern round the outside. Just buffing the silver up and giving it a shine. -And I hope it finds a good home. Rod really has worked wonders today. John inherited this snuff box so it didn't cost him anything. assuming we find the right bidders. What a cracking day it's been here at Burghley. which have all benefited from our restorers' well-trained eyes. 'And these 1920s silver candlesticks. Please, come on, somebody help me. 'But first, let's catch up with Rod and that 19th-century walnut sewing box. 'When we first saw it, the inside was tatty and coming apart. 'Has he been able to rescue it for the next generation? I'm sorry, but it's perfect! I didn't think you were going to get the blue. that I did choose had to be shipped in from France, can you believe that? Before, the sewing box was tattered, frayed and unusable. Now the sumptuous new silk has restored its former opulence. I'll be honest with you, I'm absolutely gobsmacked. I can't believe it. where really at first glance it looks perfect. Obviously as you look at it for a bit longer you can see the difference, but it's not too drastic, I think. -I'm so pleased I got it done. What a difference! I am absolutely... I can't tell you. Here we are at Sworders auction in Essex. 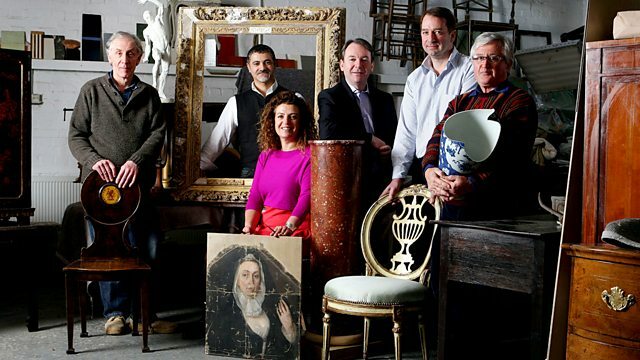 let's hope the bidders are in a mood to splash some cash. First under the hammer is the 300-year-old snuff box. Now remember, it didn't cost owner John anything as he inherited it. But he's paid £100 to have it restored, and we are hoping it will make upwards of £300. and I reckon it's worth every penny. 1475 is this good 18th-century oval tortoiseshell snuff box. 150 I start, at £150. -Can I say 60, anywhere? -I want to bid but I'm not allowed. -Come on, come on, it's worth that and more. I have to say, I'm very surprised. I think just a case of not the right people here on the day. unable to nudge above that £300 reserve price, for the time being he will get to keep it. Now it's time to see how the silver candlesticks do at the auction house in Lincoln. They were brought in by Jean Abbott. So your lot's about to appear under the gavel, so how are we feeling? Let's hope it makes the reserve. Let's hope for that, and let's hope for a little bit more. We estimate they could make between £40 and £50. This nice pair of silver candlesticks, lot 553A. £30, to start, we've got £30 in front. £30. 35? -You're in the money, honey. That was OK, wasn't it? -I'm happy with that, we got more than the reserve. more than their auction estimate, and Jean couldn't be happier. the good news is that we find ourselves with a satisfied customer. So join us again and marvel at the skill of our expert restorers on Restoration Roadshow. It’s all hands to the pump in today’s instalment as the Restoration Roadshow team swings into action once more. Against the stunning backdrop of Burghley House, expert restorer Rod Titian uses his considerable skills to revive a 17th century tortoiseshell snuff box that hides a remarkable secret. Elsewhere, Roger Hawkins has a shot at repairing a Capo Di Monte billiard table ornament with real sentimental value, and Burghley’s resident gold and silversmith, Barry Witmond, puts a pair of 1920s candlesticks to the test. In a busy day for Rod Titian he has to try and save an exquisite late 19th century walnut sewing box that’s been owned by the same family for generations. But it’s no easy task and, unless he can find the right material to match the box’s silky blue interior, he’ll be doomed to failure.